ruthdelacruz | Travel and Lifestyle Blog : Do You Have a Firande Story? Share and Win Prizes! Do You Have a Firande Story? Share and Win Prizes! If you have been following me on Twitter, you might have seen or noticed the label #Firande that I use whenever I tweet something nice and exciting. What is Firande? Firande is a Swedish word which means feast or celebration. It is nice that simple things can be called for a celebration, especially if it is captured by a camera or video. Interestingly, Electrolux traces its roots from Sweden. I am sure you have heard of Electrolux, this is one brand which gave me chance to share my ideas and even gave me interesting prizes. 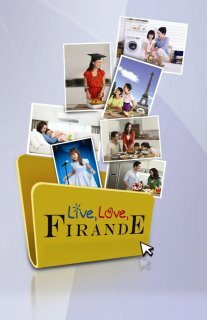 Now, to celebrate Electrolux's 10 thoughtful years, it invites everyone to join the Live, Love, Firande! Photo Contest by sharing their unique moment of Firande through photos – from remarkable achievements and important personal milestones to fun family vacations and exciting getaway with friends. I am sure everyone of you has a lot of photos and stories to share. I am just looking at Facebook and everyone has a Firande moment. To join, visit the “Live, Love, Firande! Photo Contest” tab of the Little White Book Facebook page from April 1, 2012 to May 20, 2012 and fill out the required participant details. Then, submit your Firande photo along with your answer to the question, “what’s worth celebrating to you?" in 50 words or less. I am now digging through my albums. Don't let me win this contest again. Act now and share your Firande photo and story! © ruthdelacruz | Travel and Lifestyle Blog : Do You Have a Firande Story? Share and Win Prizes!